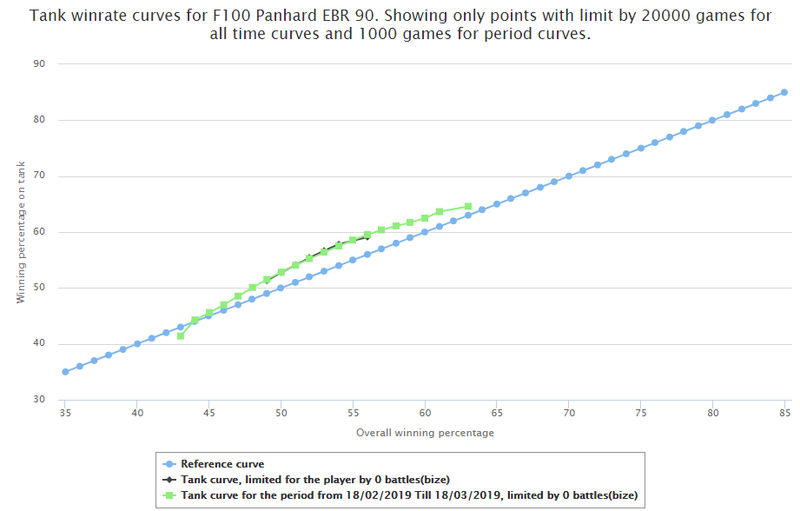 All of them are over performing to some extent, the most balanced ones seem to be the tier 6 AMD Panhard 178B and the tier 8 Lynx 6x6 while the the tier 9 EBR 90 is in it's own league of broken and grants it's players between 2 and 3.5 extra WR. Looking at these curves make it quite obvious that quite some tweaking needs to be done to balance these vehicles properly. 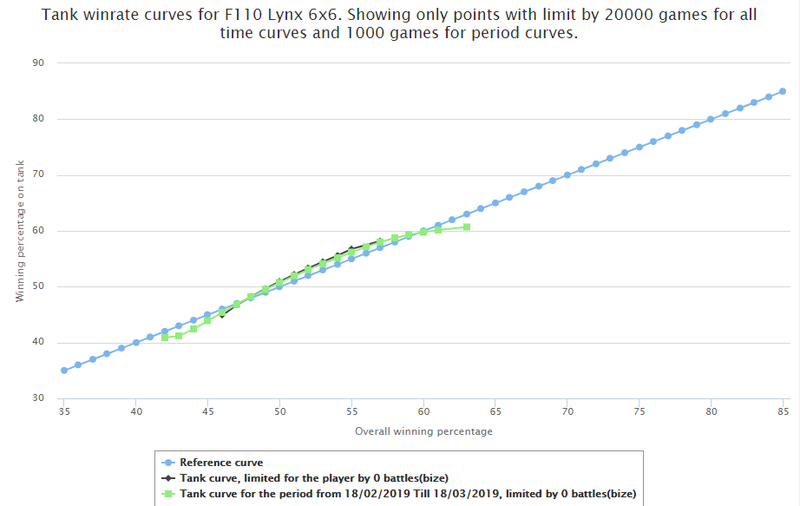 However what's most depressing is that when you compare these curves to the normal LT's it's rather obvious how huge the gap is between the impact a standard LT have in the game compared to a wheeled vehicle and there ain't many exceptions apart from the LT-432 and the AMX 13 57 which both happen to be premiums. 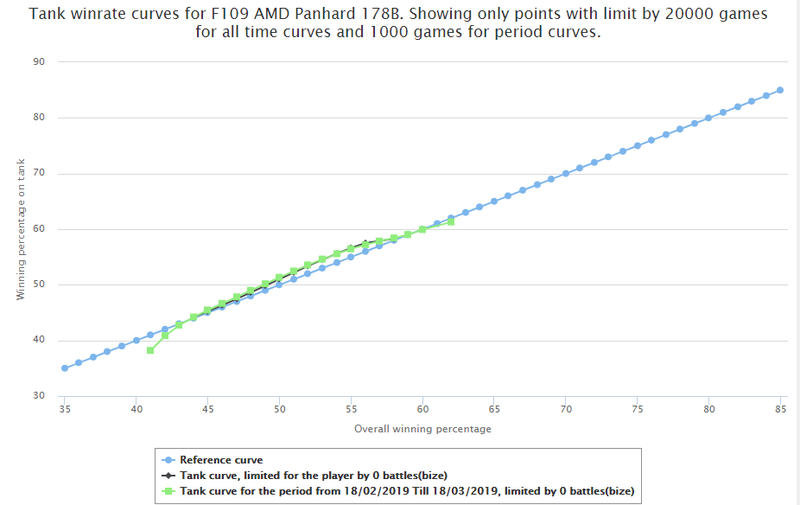 Apart from at tier 10 the WV's are the LTs that have been played the most by a very large margin, not a huge surprise there since it's a new line however if you also combine these numbers with the curves you have a huge amount of battles against a huge amount of different tanks and people from all different skill spectrum's. 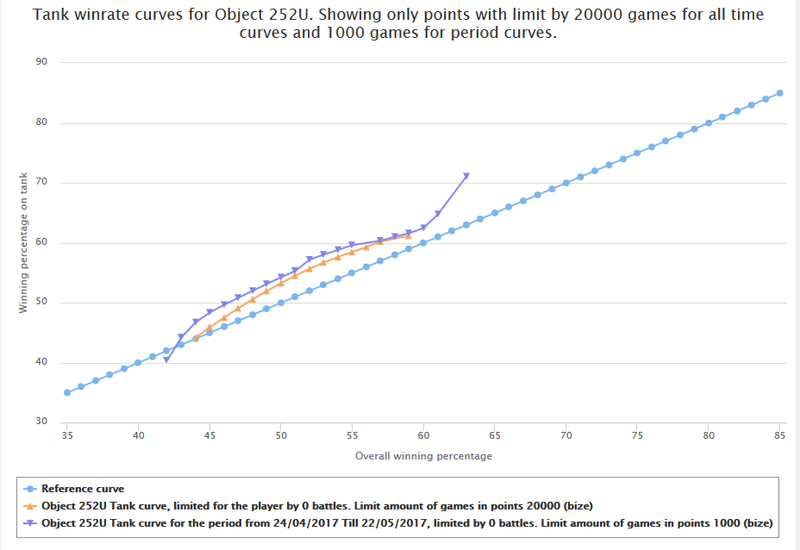 Sure the curves will of course adjust over time, that's what they are designed to do, however for comparison the Obj 268v4 was nerfed quite a bit and it's still after all this time above the reference line for 49%WR players and above. 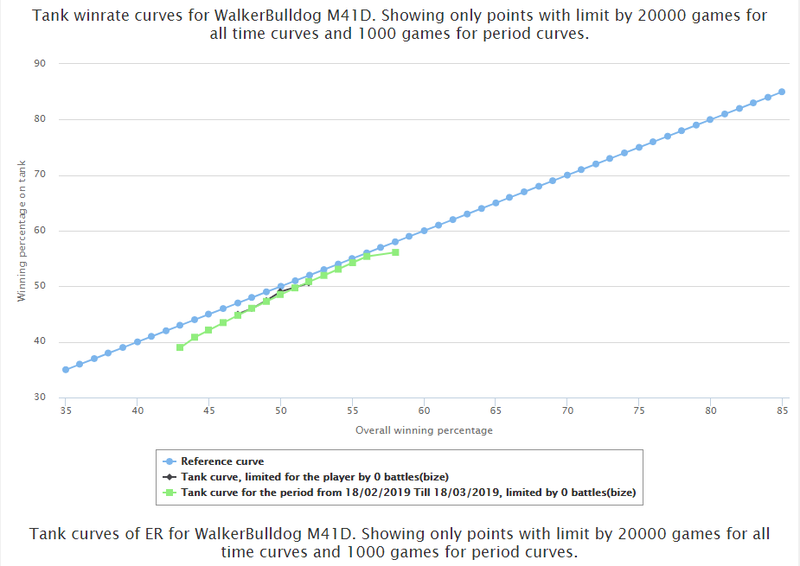 It's rather unlikely that there will be huge adjustments in these curves over time especially since they display how all players at all skill levels perform and don't just show and overall WR. Edited by SuedKAT, 29 March 2019 - 12:25 PM. While i think it need more time for these numbers to settle down they do at least explain the ruckus on the forums lately. 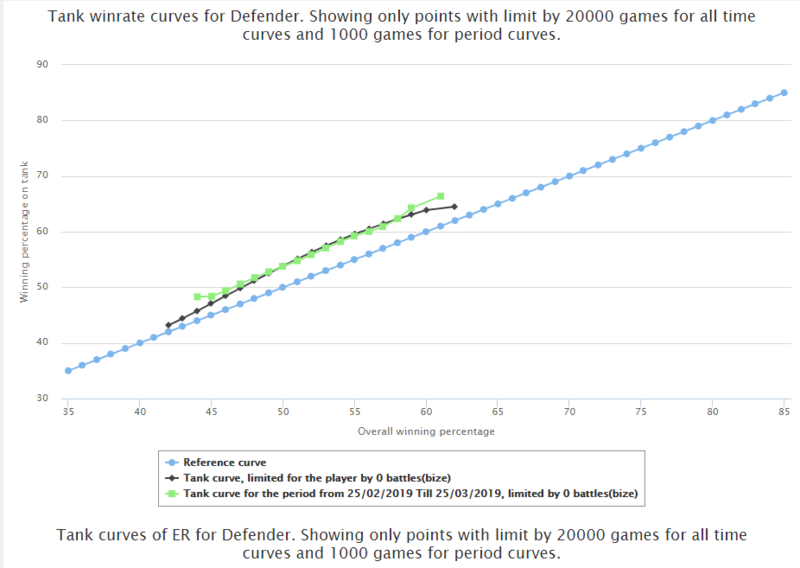 Edit: Also if you check the mid tier LT's and compare their current WR curve with one before the WV's were introduced most of them seem to be somewhat negatively affected by the the WV's, so overall it looks like the WV's have been a nerf to standard mid tier LT's, the higher tier ones don't seem to have been affected the same way. Edited by SuedKAT, 28 March 2019 - 10:42 PM. The lower view range is barely a disadvantage on a lot of maps due to the ridge line layout, on every single other attribute they are better. Most importantly they cannot be tracked. Noobs like me are still at tier 7. How long before a new round of rebalancing the vehicles? And will it happen before we are flooded with armoured cars of other nations? No big surprise here. Even 45% players get a major improvement in wr for these tanks by just driving around like morons. It's clear that most of the other tech-tree lights need to be buffed. Still too early to say but I expect most of them to overperform for everyone. Yes they have a high skill cap but at the same time they offer a major boost to all the far more numerous bad scouts. Just driving around like an idiot, making erratic peeks and counting on the bad accuracy mechanics of the game and the fact you can't get detracked to keep you alive tends to get you lots of spotting damage through arties and TDs. Especially low velocity guns will almost never hit them from any proper distance and I've seen really awful players make really awful play with them and with a little bit of luck they get much more out of it than they ever deserved. There was a time when suiscouting was considered a terrible play. Wheeled vehicles are the result of Wargaming wanting to make it a good play and it's hard to deny that they have been successful. This just means the active players are going to be spotted even more and the base camping TD bots and arties are going to get more damage. I don't think they are the most overpowered vehicles in the game but they highlight the key problems of the game. Exactly. They are CARS. They should explode immediately after a hit of a tank shell... But as this is a game and it needs to be enjoyable, they should at least slow down. I'm not saying that these things are OP at all, but this mechanic and physics is just ridiculous and makes the game more frustrating. Other problems that the maps are too small for these vehicles (and for this speed), plus they don't encourage tactical gameplay and brainwork. Add the stupid "easy mode" autoaim and you get somewhat too much for the stomach. Edited by Gardar7, 29 March 2019 - 08:41 AM. Just as you would expect a new tank line performs. 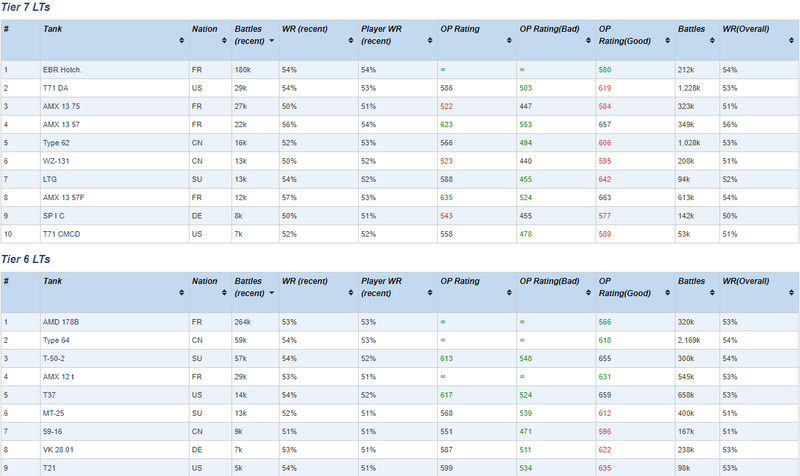 Higher tiers seemingly perform better although it's just being played by the better players. A good player performs better and is likely to win more games than an average player. More wins mean more XP which means faster grind. There are 108 000 T6 AMD 178D's on the server while only 3800 EBR 105's. 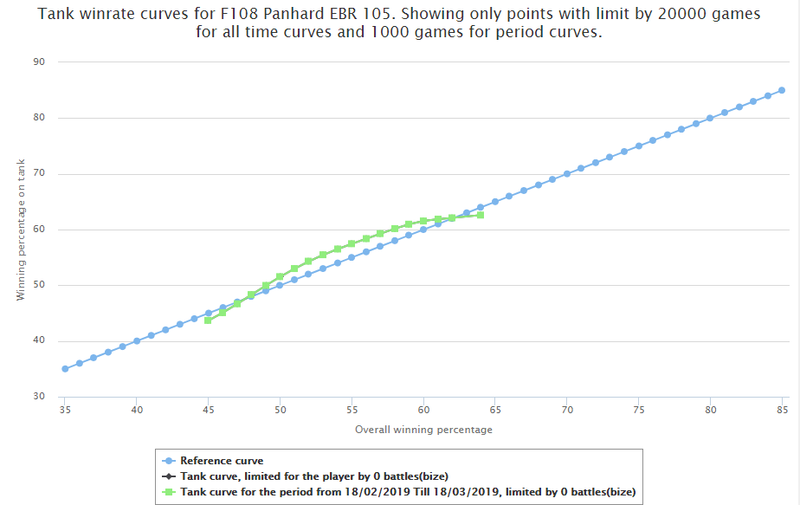 The T10 is owned by players who are either really good and can grind tank lines fast or by players who have accumulated free XP over thousands of games to unlock the tank at launch. T6 can be bought by anyone who wants to try out the wheeled vehicles. T7's better performance is caused by the simple fact that T6 and T8 are bottom tier all the time. T7's MM isn't as bad. We can look at these statistics again when we get 50 000 EBR owners. Now they are irrelevant. Let’s see if it ever happens with people fleeing the game and all! 50k was maybe a bit over as I was comparing it to AMX 105 with 58k owners. WZ-132-1 is the least owned T10 light with 21k owners so let's drop the EBR 105 to 20k. Numbers for the higher tiers are just too low to be meaningful, we are talking like 3-5k owners for the tier 9 and 10, that is tiny compared the active playerbase. Also players need to learn to adapt and play against them, at the moment they are mirror matched against normal lights and most normal light tanks players have not adjusted their playstyles when facing them, they do the same things over and over, like trying to rush to forward spots where WVs will beat them or drive around trying to have auto-aim on the move fights when the WVs are simply better for this. We need to see where we are in 3-4 months when they have been in the game for a while, more players have got to higher tiers and players have had a decent amount of time to adjust to them, then see how they are performing. But IMO long term they won't need nerfing, what they probably need is to be reflected as their own class more in the MM, because in some situations having a WV is an advantage to the team if its facing a normal light and in some its a disadvantage. I don't believe it's true about the number of players not being sufficient for an accurate sample size. For player numbers at tier 9, all LT tanks have 972,153 as a total population, so for 99% confidence with 2% margin of error you'd need 4,143 players. The tier 9 EBR has 5,671 exceeding the sample size needs. For battle count at tier 9, it's a similar picture we are well within reasonable sample size. And the curves cover all win rates played, not just good players. If you go back to wot-news and turn off the cubic-spline interpretation then this also shows them over performing with the raw data. edit: I will add that I do agree the player base still needs to complete its "adaption" to the tanks, and that rather than sample size may cause a lowering of the win rates. Edited by evilchaosmonkey, 29 March 2019 - 09:28 AM. What's your point with total sampel size? You can't compare a tank which got released 1 month ago to tanks which have been in the game for over 2 years. (IMO) Active/Good players are players who are interested in the game and are trying to improve. Those are the guys who are going to research new vehicles first. Players who play 10 games a week or grind 5 lines at the same time without any care in the world aren't going to reach those tanks in a while. Players who are improving have a higher winrate than their overall winrate. That's why the higher tier tanks have a better winrate. Players who don't care about improving and are happily sitting (let's say at 52% winrate) are still at T6/T7. The thing is that probably quite a few good light tank players have switched to WVs for now as WVs are more suited to their playstyle. On the other hand most ordinary players haven't yet reached the higher tier WVs. 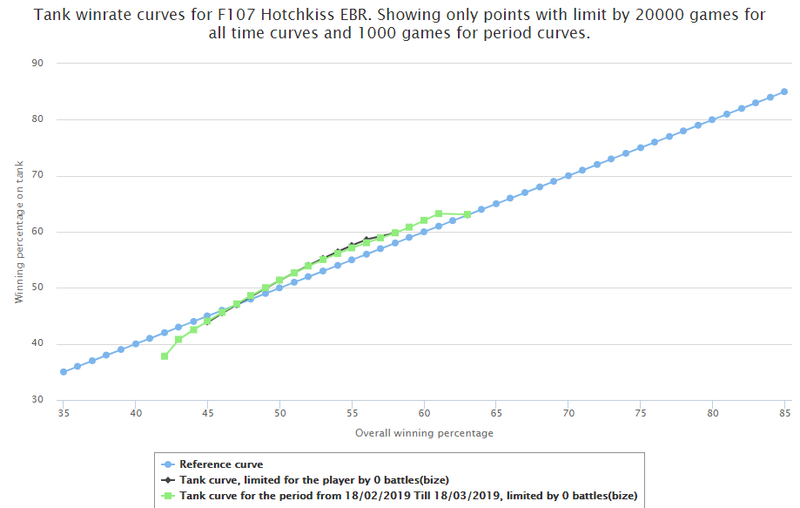 Actually pretty clear if you look at the relatively bad EBR 75 stats. Even though it is probably the strongest WV tier-by-tier due to the burst and reatively high DPM, as everyone could buy it stats were normalized by not-so-good light tank players. Also obviously "normal" lights will suffer a bit as WVs are effectively designed as dedicated counter tanks. Edited by Geno1isme, 29 March 2019 - 09:56 AM. People talking about Obj268v4 soon after release while clearly over performing: "Tank is over performing, nerf now plx"
People talking about WV soon after release while clearly over performing: "We need more time to tell"
The Defender now two years later. Notice the difference, no neither can I, well not much. 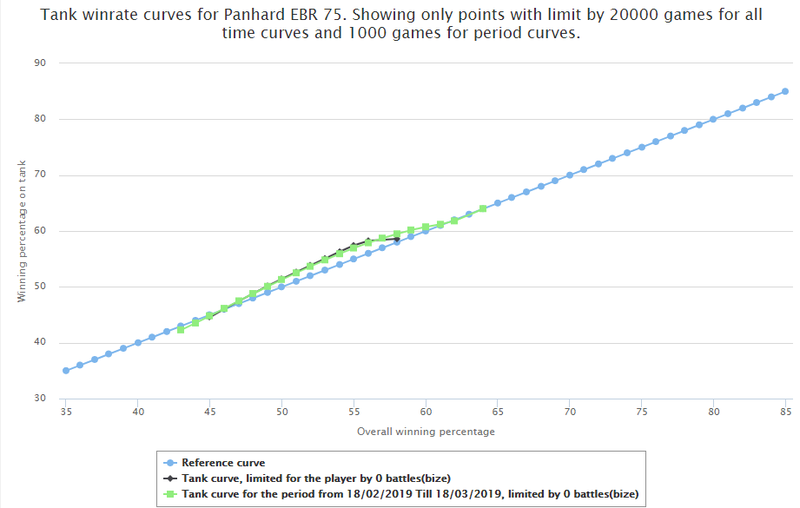 The point is the curves probably won't change very much over time, partly as WV players improve just like the main population improves when dealing with them. Yes I am sure denial arguments like these tanks are grinded and therefore only the best of the besterest will get them whereas the defender was open to all, but these aren't particularity valid. Think about access to the defender and the range of players who actually bought it and realise that a likely similar range (statistically speaking) of players have ground up the tanks in the WV line as their curves show access by a wide variety of players too. Therefore sample size is possibly about right now - though I very much hope to be proved wrong and the wheelies realign themselves to win rates as per other lights. Edited by evilchaosmonkey, 29 March 2019 - 10:22 AM.